The 2019 Florida might just be a replay of the Fountain of Youth Stakes-G2 as far as the top three finishers are concerned, and we just can’t get the big late run of Bourbon War in that race out of our head. The runner-up in the Fountain of Youth came flying late to finish second, beaten three-quarters of a length behind winner Code of Honor and was also two lengths in front of fourth-place finisher Hidden Scroll. He now gets an extra sixteenth of a mile to work with. All three are back for the Florida Derby, all three are set to improve again, and the race should set up similar to the Fountain of Youth. Bourbon War and Irad Oriz Jr. might have had just a bit of a tight trip in the Fountain of Youth while trying to follow Code of Honor, who had a beautiful rail trip under Hall of Famer John Velazquez. Code of Honor got the jump on Bourbon War on the final turn in the Fountain of Youth, took over from a tiring Hidden Scroll passing the eighth pole and held on late for the win. Bourbon War should be fully primed for the Florida Derby as he makes his third start off the layoff and Ortiz should have him figured out by now. Expect him to come flying late. Code of Honor will probably get another great trip from Johnny V., whose timing in the big races this year has been impeccable. He doesn’t come from as far back as Bourbon War, and he could get the jump on his rival again today as he makes his second start off the layoff for top trainer “Shug” McGaughey, but we just don’t think Ortiz is going to let that happen again. Morning-line favorite Hidden Scroll breaks from post one, and he’ll likely have to go early as he did in the Fountain of Youth, but he has to go slower. He went far to fast on the front end in the Fountain of Youth while under inside pressure to the final turn, and by the time he got to the stretch he was justifiably tired. Hidden Scroll gets a new jockey for the Florida Derby, as Javier Castellano takes over from Joel Rosario, and we expect Castellano to try and rate him, although he could still be on the lead. If Hidden Scroll opens up early and rates through a reasonable pace he could be very tough to catch as he makes his third start off the layoff for Hall of Famer Bill Mott. After the top three, it’s anybody’s guess. Win, Place, Show plus exacta and trifecta betting at Bovada’s Race Book. Maximum Security started his career three starts ago in a maiden claiming race for a $16,000 tag and won by 9 ¾-lengths. 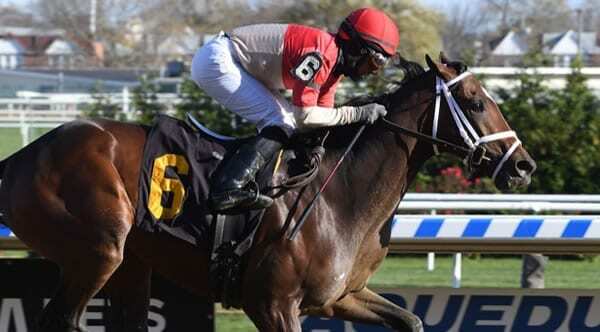 He then came back and won his next two starts in allowance races at Gulfstream by 6 ½-lengths and 18 ¼-lengths. He totally outclassed his field in his last going seven furlongs and had his ears pricked turning for home as he romped away for ultra-hot trainer Jason Service, who is winning at an unbelievable 45% clip. Maximum Security is moving way up in class for this race, but is quick from the gate and could open up early. It’s difficult to tell if he’ll go 1 1/8-miles, and Ortiz, who rode him in his last, sticks with Bourbon War. Still, he has to be the wild card pick based on his speed and his hot trainer. Harvey Wall Banger comes into this race off a good but not great win over fellow Florida Derby entrant Everfast in the Holy Bull-G2, but he had a perfect rail trip in that race, and Everfast came back to finish eighth in the Fountain of Youth. Current has made five of his six lifetime starts on the turf and makes his second start off the layoff for trainer Todd Pletcher after finishing third in a listed turf stakes. He also loses Castellano to Honor Code. Hard Belle has a nondescript form and doesn’t look like he belongs in this race. Bode Express is still a maiden but was only beaten a neck last time going seven furlongs and earned a 91 Beyer Speed Figure. He looks to be improving, but two starts ago in the slop at Gulfstream, he was beaten 18 lengths by Hidden Scroll. Union’s Destiny comes into the race off a sixth-place finish in the Fountain of Youth and looks like he would have to improve quite a bit to make a dent here. Garter and Tie also finished sixth in his last start in the Holy Bull Stakes behind Harvey Wallbanger and also looks to have reached his “class ceiling”. The two main speed horses, Maximum Security, and Hidden Scroll will dictate how this race shapes up. We’re going to guess that Maximum Security goes to the lead early while rating and is soon pressured by the high-class speed of favorite Hidden Scroll. The latter should take the measure of Maximum Security on the turn for home, but he may not get by that easily if the pace is slow. Regardless, those two should set the race up for a rematch between Code of Honor and Bourbon War in the stretch.